Studying at Proyecto Español with a group! The students of Proyecto Español do not always come alone, but also in groups. It is possible to come to Proyecto Español with classes, small groups of friends or even with your own sports club! Activities will be organized, groups will be divided into classes and there is also enough spare time to do activities yourself. I spoke with Caroline, who came to Alicante with her own students. Caroline is a full-time Spanish and Dutch teacher from the Netherlands and goes on a trip to Spain with some of her students every year. She has been to cities like Malaga, Sevilla, Salamanca and more. Every year, about 20 students come with her, all of them with different levels of Spanish. The students are mostly people over 40 years old. The most important aspect about the trip for Caroline is that the students have a lot of fun. ´If they don´t have fun, the trip does not make any sense. Of course they also learn a lot here which is also important´, she said. At Proyecto Español the teachers teach fully in Spanish, which makes it more interesting for the students and they learn even more. Caroline´s students are all learning Spanish for different reasons. ´They are all highly educated students with broad interests and they are always updated on what´s happening in the world. Many of them were teachers themselves in the past and are interested in learning a new language. Others have daughters who will marry a Spanish man and that´s the reason they want to learn Spanish. Everyone has their own reasons´, she said. When asked about the school, Caroline mentioned that the school’s environment is very open, modern and nice. ´There is a nice atmosphere and the teachers are very friendly´. 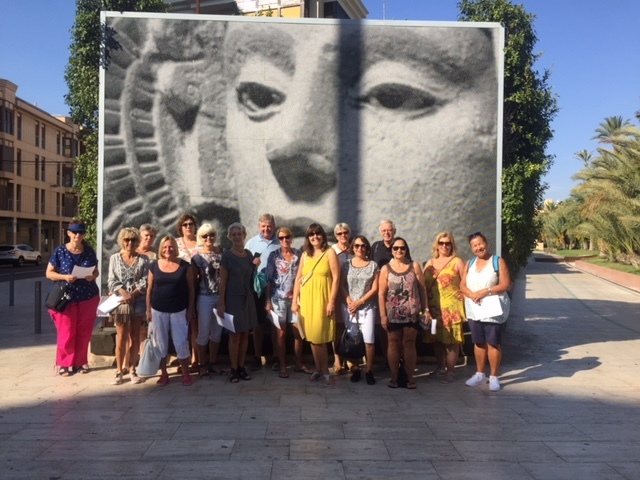 She joined different activities together with her students; they went to the archaeological museum in Alicante, the Santa Barbara Castle and other museums. Besides these activities, they also did some relaxing on the Postiguet beach after their classes, which is only 10 minutes walking distance from Proyecto Español. One of Caroline´s favourite moments were the times they went to an Italian restaurant on the square right in front of the cathedral. They went to eat there 3 times and really loved the plaza’s atmosphere. Caroline and het students went home after 1 week of studying at Proyecto Español and had a great time!